This is the second in our 4 part series of articles on residential pre-sales where we provide a discussion on some of the pitfalls and risks inherent in pre-sales. We also share some key tips on how lenders can mitigate risk. To some developers, all pre-sales are equal. Yet, developers need to understand that lenders, concerned with maintaining prudent lending standards, focus on the quality of pre-sales. Check and follow internal policies. Be sceptical, particularly where no agent is involved (misrepresentation can be a key issue). Review the pre-sale information that developers provide. Try to identify all buyers. Refer all contracts to a lawyer for sign-off. Manage diligently on an ongoing basis. Developers often consider pre-sales to be a necessary evil. The downside for them is that pre-sales are a funding requirement that can reduce the end value and profitability of the project. However, developers have no choice but to lock-in pre-sales. Problems can arise if project delays occur – in Council, in contractor negotiations and when seeking finance. These days, lenders often require a development consent, construction contract and pre-sales to have been locked in before they consider a loan application. With finance difficult to obtain, there are often delays, which will result in cost increases, particularly in a rising market. Once pre-sales are locked in, there is no opportunity to pass these cost increases on. Someone in the development chain must bear these cost. In this article, we have focused on pre-sales risk from a lender’s point of view. Ultimately, lenders’ securities entitle them to receive 100% of pre-sales revenue and in turn they bear 100% of pre-sale settlement risk until the loan is repaid. 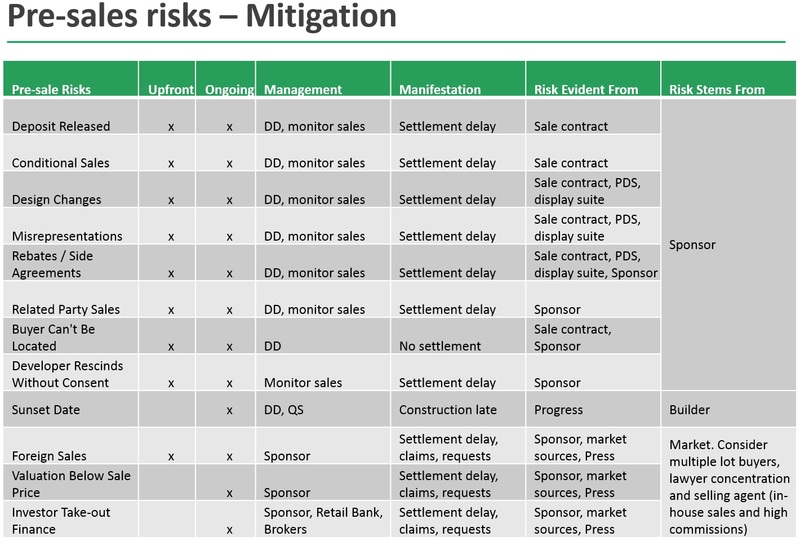 The following table lists many of a lender’s key pre-sale risks. It outlines when these risks occur, possible symptoms, where they can be identified and where the risks are likely to stem from. Lenders recognise sponsor reputational risk as a significant risk in property development lending. Many pre-sale risks occur at the very beginning of a project, and many stem directly from the sponsor (e.g. misrepresentation). With thorough due diligence, lenders can eliminate key risks before drawdown. Errors at this point can reflect poorly on a lender in a default scenario, so care is advised. Understand the developer’s sales process and commission rates. Visit the display suite and the development website and do further online research. Consider sales rates and movements in average prices over time. Is the sold stock representative of the whole development? Does it raise any design or value questions about the unsold stock? Check the plans against the sale contracts and marketing material and reconcile them to the building contract and quantity surveyor’s report. Review the proforma contract and special conditions. Identify the purchasers where possible, and the location and amount of deposits paid. Ensure a comprehensive legal review of the pre-sales is completed. Developers should be mindful of the concerns of lenders in relation to pre-sales. Efforts should be made to explain why possible risks do not apply in their case. Developers should produce supporting evidence as inadequate information will cause finance delays. Regular reporting of ongoing pre-sales results will be required and an appropriate compliance process should be put in place. Our broad experience and industry resources equips us to assist in the most complex situations. Please contact Costa Nicodemou or Brett Lennane to find out how we can support you. Access earlier articles in this series here.